Auto Parts Train St. Elmo. 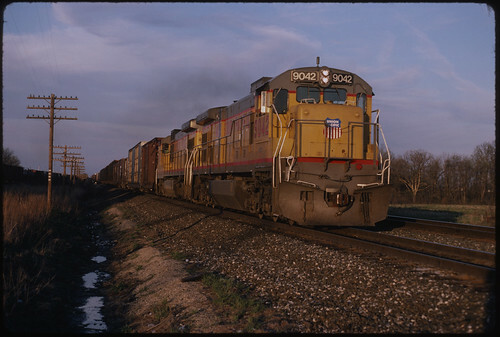 Union Pacific C36-7 9042, still adorned with "Missouri Pacific" lettering on the hood, leads a southbound auto parts train at St. Elmo, Illinois on the evening of April 9, 1988. The train is on the former Pennsylvania at this point; a UP train without a crew pauses on the former C&EI, which was used as a siding at the time, at left.